During the last three years, when counterfeit goods are found in Dubai, the decisions by Customs is to re-export them back to where they came from. This is generally seen as unsatisfactory to brand owners because it means the counterfeit goods still exist and may move to other markets or even be sent to Dubai again by other means. Finding alternatives to Dubai Customs’ “Re-exporting” decisions for trademark cases was one of the most highly discussed topics during a workshop conducted by Dubai Customs Authority in November 2014. The workshop was attended by senior delegates, brand owners’ representatives, diplomatic commercial attachés in the region, intellectual property (IP) attorneys, and others. The Director General of Dubai Customs re-affirmed his commitment to support all border measures that protect the rights of IP owners. As a result of this workshop and Dubai Customs desire to implement a new policy, Al Tamimi & Company has taken extensive efforts to structure practical steps that will enhance the procedures and promote the adoption of alternative options for rulings in Customs’ seizure cases. After many years of receiving unsatisfactory decisions (i.e. issuing orders to re-export counterfeit goods and/or release counterfeit goods), Al Tamimi & Company’s Intellectual Property Department worked closely with brand owners to develop a discussion with Dubai Customs Authority to change the “re-exporting” policy in IP cases. After a great deal of time and effort, a new mechanism to dispose of the counterfeit products was adopted, one which is practical and environmentally friendly: recycling. Dubai Customs’ “Re-export” policy was based on environmental concerns, since the volume of counterfeit goods seized is so massive that if destroyed it would cause huge, unexpected loads on the waste sites managed by the Dubai Municipality. Consequently, the Dubai Municipality objected to destroying the goods. Recycling however avoids the creation of additional waste whilst also destroying the counterfeit goods so that they can do no further harm to the public or brand owners. The new recycling policy, as an acceptable way of destruction, is now in place and Al Tamimi has already had success in using it. Our firm pursued a recent case before Dubai Customs, on behalf of a major Tobacco Company, wherein we were able to accomplish a promising, unique and pro-trademark decision, which was eventually issued and executed for the benefit of the brand owners. During an ad-hoc inspection conducted by Jabel Ali officials, a suspected shipment comprised of around two million counterfeit cigarettes was spotted at the storage facility of a logistic. Forensic inspection for samples was undertaken which determined that they were counterfeit. An official customs complaint was lodged by Al Tamimi & Company on behalf of the brand owner to seek confiscation and destruction, through the recycling, of the counterfeit goods at an accredited service provider arranged by the Tobacco Company. This was accepted by Dubai Customs and on 18 March 2015 the goods were recycled. This case establishes an important precedent for trademark owners in customs cases and encourages Dubai Customs Authority to revisit their border protection strategy. Customs showed its willingness to work with brand owners on alternative solutions for their IP customs cases and to change their re-exporting policy for a more environmentally sound recycling policy. There are indications that Customs Authorities in the wider UAE are trying to uniformly implement the recycling policy, as evidenced by contractual undertakings with UAE local recycling companies. 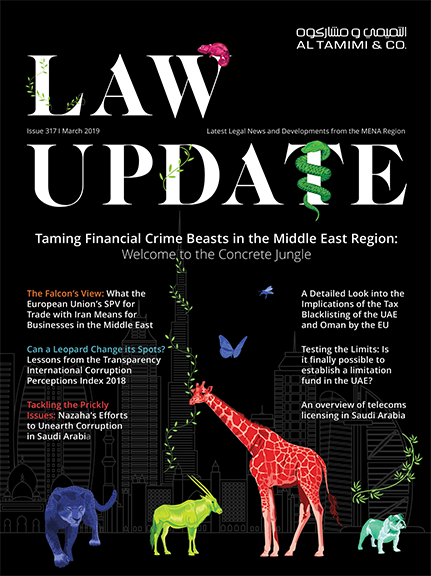 Another positive feature of the case is that this precedent was accomplished by the Dubai Customs Officials in Jabel Ali Port, which is the busiest seaport in the region. Their willingness to conduct ad hoc inspections for logistic companies and service providers in the free zones, and put extra efforts and measures to ensure their compliance with trademark cases, is a monumental step in the right direction for the implementation of the recycling policy and the enforcement of IP rights generally. We are keen to utilize this landmark decision to revitalize the excellent cooperation between brand owners and Dubai Customs on different IP protection strategies. This will hopefully open a new era of cooperation in IP enforcement with border authorities, and set a new protocol to dispose of counterfeit products with environmentally friendly technologies, which is of the utmost importance for all stakeholders involved with this process. Al Tamimi & Company IP department, led by partner Munir Suboh, took the lead on this case at all stages, including passing the intelligence information to law enforcement, assisting in issuing orders for the inspection of suspected facility, assisting with the official seizure and inspection of goods, forensic examination support, the issuance of the confiscation and recycling order, and execution of the same. This article first appeared on WTR Daily, part of World Trademark Review, in April/2015. For further information, please go to www.worldtrademarkreview.com.